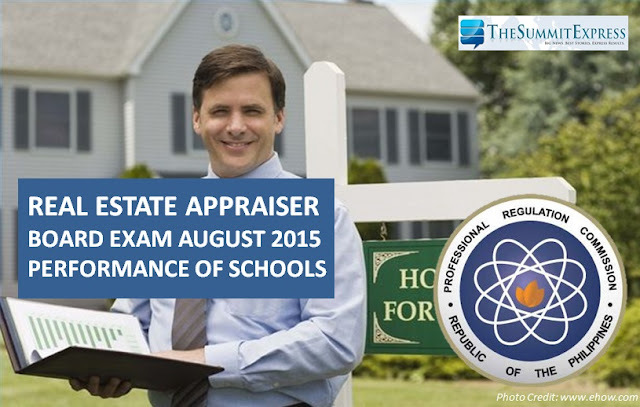 The Professional Regulation Commission (PRC) officially announced on Monday, September 7, 2015 that 2,462 out of 4,731 passed the Real Estate Appraiser board exam given by the Board of Real Estate Service in Manila, Baguio, Cagayan de Oro, Cebu, Davao, Iloilo, Legazpi, Lucena and Tuguegarao last August 2015. PRC did not release the list of top performing schools for August 2015 Real Estate Appraiser board exam. Meanwhile, a University of the Philippines (UP) - Diliman graduate Aiko Frances Namuag Sagusay topped the board with 87.00 percent grade.